JENN: Welcome back the world's greatest travelling companion, Elizabeth! She's coming with me for Wine & Dine, her first trip in almost four years. There is but one purpose to this blog post: to find out what's got you excited/what you're looking forward to in Walt Disney World! Feel free to take off, but if you'd like more structure than that, I'm happy to give you categories or something. JENN: Yeah, not this time around, since Epcot will take most of our attention. 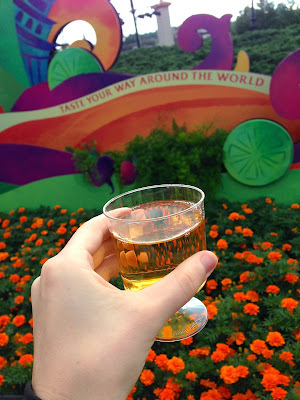 ELIZABETH: Also, I enjoy more than I probably should going to the place where you can try out the different sodas in Epcot (I'm sure you remember what it's called). JENN: Haha, yes, Club Cool. The sodas have all changed! ELIZABETH: Ooooooooh! New things to try! Yay! I think Epcot was the first place I ever had hibachi as well, though it's not something I specifically look forward to. And one of these days we will have to try and finish the Around the World drinking challenge. We were so close last time. JENN: Don't worry, the Food & Wine Festival has all the alcohol you ever wanted. ELIZABETH: Excellent! All right, so moving on - I will say that I am looking forward to the easiest-to-use bus system ever. As much as Disney can be a little scary with the level of control they have over everything that goes on there, I love not having to wait more than ten minutes to get on a bus (at least, that's what it feels like). JENN: Yeah, while you can occasionally run into hiccups, they're usually pretty good. ELIZABETH: Also the monorails! "Por favor mantega se alehado de las puertas" (or however it's spelled). [So close! :)] I always like taking the monorail that goes through the Contemporary Resort. ELIZABETH: Yes, rides! There are so many... Okay, Space Mountain is a nostalgic favorite. And Tower of Terror is weirdly nostalgic for me, because the first time it scared the crap out of me I was 7. So I am looking forward to dragging Jenn on to that one. JENN: It still scares the crap outta me! ELIZABETH: Yeah... you saw me the last time we went. I'm fine until it starts, then I realize that at some point they're going to DROP ME. JENN: I hate the anticipation! Once I get past the first drop I'm usually okay. ELIZABETH: Yeah, it's such a relief to have it over. and the rest of the ride is pretty cool, with the ghosts and everything. JENN: How about new stuff? Anything you haven't tried? 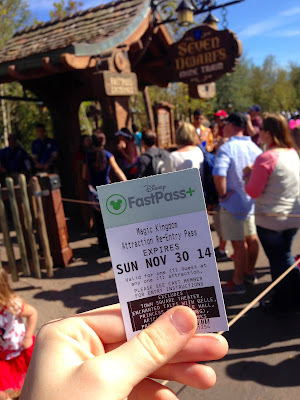 ELIZABETH: Oooh yes, I am curious about the Snow White ride [Seven Dwarfs Mine Train]. What else is new..
JENN: Have you seen any of New Fantasyland? The Ariel ride and Belle themed areas? ELIZABETH: No! I think that was all still being worked on that last time I was there. I am a fan of both Ariel and Belle! So yes, the whole new expansion in general I am looking forward to. Makes me want to watch Snow White, actually. I think I've only seen the whole movie the whole way through once (I know, for shame). JENN: Haha, you'll be fine. We'll share sample sizes and rejoice. ☺ Anything else spring to mind? ELIZABETH: Hmmm, well I may try to order something in French while in Epcot, though my language skills have gotten a bit rusty. ELIZABETH: Does Norway still have the Maelstrom ride? Basically I am just really, really excited about that whole park. :D Everything else is just a perk. ELIZABETH: Bah.they should ask for my approval before making ANY CHANGES. ELIZABETH: I suppose I can let that one slide. But that's just about everything I can think of that I'm really excited about (aside from all the rides I enjoy, like Everest and the Safari ride, etc.). JENN: It's a great start - it's gonna be AWESOME. BREAKFAST! WHAT ABOUT THE ANNUAL EPIC BREAKFAST?!?! ?